1/28/15 Men’s Basketball — Oregon at Arizona 7 p.m. The Ducks travel to the Grand Canyon State where they will seek to avenge their 80-62 January loss to the No. 6 ranked Arizona Wildcats. 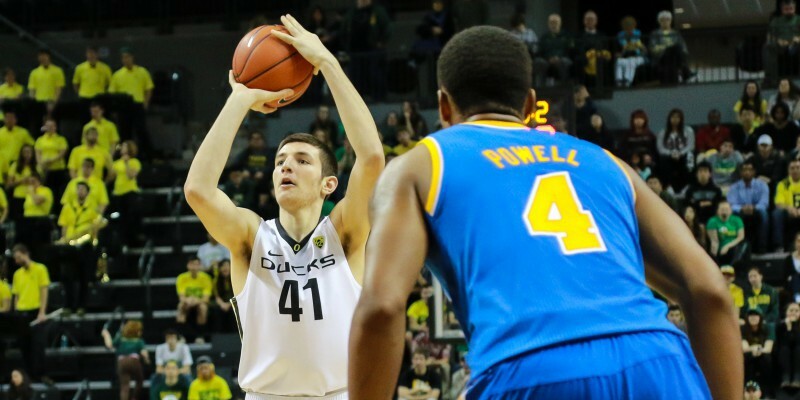 In last week’s game, the Ducks notched a win against UCLA and the fans received a pleasant surprise when the newest Duck, 6’10” Israeli forward Roman Sorkin, canned his first shot, a mid-range jumper. 1/30/15 Men’s Basketball — Oregon at Arizona State University 5 p.m. In its previous outing, the men’s tennis team beat a strong Alabama team in Chapel Hill, NC. Oregon’s men’s track and field team were ranked No. 1 in the nation this week. The women dropped one spot into the No. 4 position. 1/31/2015 Women’s Basketball — UCLA at Oregon 12:30 p.m. The Ducks try to rebound from last weekend’s tight loss to Arizona. This week they also lost junior guard Chloe Stiles, who left the team on Monday. Last week, Oregon beat UNLV on the road in Nevada. 2/2/15 Women’s Basketball — USC at Oregon 5 p.m.